In my time as a Savannah Georgia Wedding Photographer, I have been lucky enough to visit a variety of venues with my clients and I have captured many timeless photos in these venues. It has always put a radiant smile on my face to help a couple create a moment that they will look back on and cherish many decades later. The wedding day is arguably the most important day in a couple’s entire marriage. It represents the beginning of something great; a door flying wide open on an endless landscape of possibilities. The bride and groom get the opportunity to say to each other “I do”, and spend the rest of their lives practically living up to that claim. Wedding photography has a special place in all of this. It enables the couple to capture that special moment when the spark was lit in earnest. Of course, they represent the center of attention. The spotlight is on them and so will all the eyes when the photograph gets a look later. However, just like a sunset is greatly enhanced by the clouds and mountains in the background, so is the couple enhanced by the beautiful background in their photo. Getting the perfect wedding location is crucial to getting the perfect wedding photograph. The first step is knowing how much you plan to spend, and the first step to that is knowing what kind of wedding you want to have. If you’re looking for a big wedding with a bold theme, then you need to set the right budget for that and get financial contributions from friends and family early enough. It’s even better if you decide to fund your wedding yourselves and plan everything around your budget. Once you have a good idea just how much you’re willing to spend on a wedding venue, finding the right one for your budget becomes much easier. Depending on your budget, the number of guests you expect, and the theme, you can easily narrow down your search to a few viable locations. It’s important to know all the relevant details of your wedding while you conduct your search so it’s more informed. It’s important to start your search early. This becomes especially important if the venue you have in mind happens to be coveted by a lot of couples. Booking the venue early gives you peace of mind and saves you a lot of headaches during the planning phase since you’re already sure of the venue and can plan everything around it. A good Savannah Georgia Wedding Photographer will have a great portfolio of wedding photographs from previous clients. They should also have an online profile and maybe a website where you can go and learn everything you need to know about them. Personally, I keep all of my best wedding photographs from different venues around Savannah Georgia on my website and social media profiles so prospective clients can vet long before they try to contact me. Vetting your photographers early gives you time to look at their different works and settle on a winner. It also allows you to look at the strengths of different photographers. You’ll be able to see the different venues they’ve taken their pictures at and find one who’s good at taking photos in a venue like the one you’ve chosen for your wedding. Savannah Georgia boasts a whole plethora of excellent wedding venues where you can capture your special moments. As a Savannah Georgia Wedding Photographer, I have had the privilege of shooting at all the locations I am going to list below and many more. Each venue is an excellent taste, just as good as the next one, and what you settle on will eventually be a matter of taste. Whitefield Chapel – This stunning building lies shrouded in alluring mystery with great oaks in the background and Spanish moss acting like icing on the cake. The building itself is an example of aesthetic design with red bricks in the walls and on the floor as well as arched windows and wooden pews in straight rows. The Mackey House – This wedding venue screams “charm of the south!” from the entrance to the beautiful rooms at the colonial house that graces its grounds. The outdoor pavilion is an excellent location for wedding photography and the manicured lawns will add an unmatched charm to the background as you capture all your favorite moments. Georgia State Railroad Museum – If you want a rustic, historically rich vibe to your wedding photos, then this is the perfect venue. The old brick walls will tell a brilliant story in the background while your smiles in the foreground add some flourish. The lofty indoor areas are perfect for hosting the guests during receptions and will provide more than ample space for great numbers of people. 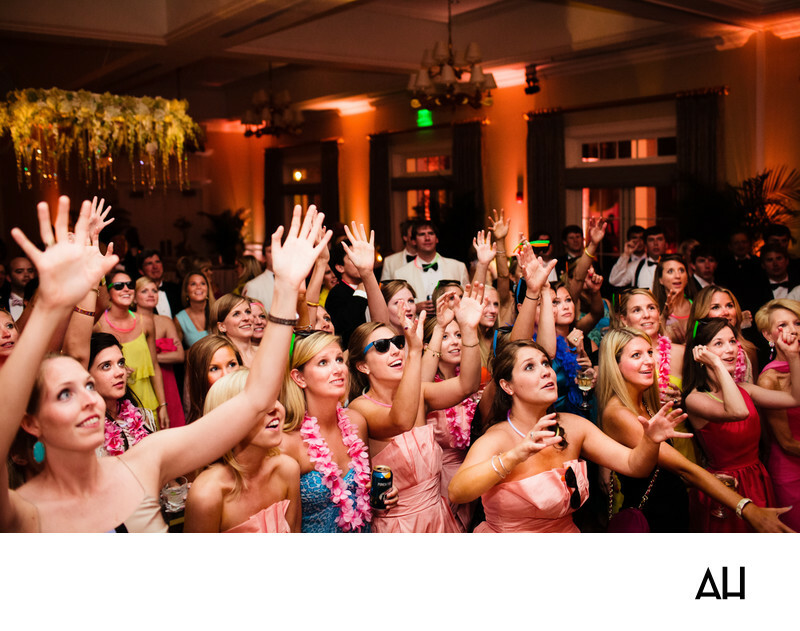 This particular image was taken during a wedding reception at the Savannah Golf Club. This is a private, member owned club that has been around since 1794 and also happens to be the oldest golf club in America. Savannah is also believed to be the city where the game of golf was first played. You don’t need to be a member of the club to hold your wedding at this venue, but you do need the sponsorship of a member. This particular image was a joy to capture. The bride, though not visible in the image, is just about to throw a bouquet at the eagerly waiting crowd of women. You can see the joy and expectation so clearly on their face and only imagine the smile on the bride’s face as she lifts her hands and lets go of the bouquet. The bride will have a great opportunity to see the faces of her friends and family as she looks at the photograph later on and feel the emotions all over again.